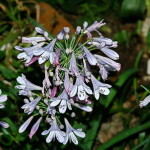 Agapanthus africanus has a short stem bearing a tuft of long, narrow, arching leaves 10–35 cm long and 1–2 cm broad, and a central flower stalk 25–60 cm tall, ending in an umbel of 20-30 white, or bright blue, funnel-shaped flowers, each flower 2.5–5 cm diameter. This tufted, hardy, evergreen perennial is impressive in mass plantings or borders along flowerbeds and paths. 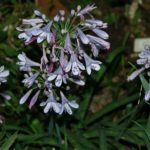 It is also a good plant for the difficult areas that are in shade for part of the year. They attract insects to the garden and thus birds. They also have many medicinal and magical uses. Agapanthus africanus forms clumps and need to be split every 3-4 years to retain their attractiveness.